I begin typing up this post on the first day of spring and the brink of yet another nor'easter here in New Jersey. School will be closed again tomorrow and I find myself, once again, hoping for the best. It's hard to believe it's officially spring today (as I write this) and Easter is only a short week or so away. Looking on the bright side, it means warmth, sunshine, flowers, and colorful produce is on its way too. I have to believe it. In the meantime, I thought I'd take my mind off storms by thinking and writing about food. It's always about food. When a storm is imminent, we immediately think about food and hit the grocery stores. I've already got a bowl of oatmeal chocolate chip cookie dough sitting in the fridge, ready to be baked tomorrow while we're hunkered down at home. As long as we don't lose power, we'll be good to go. But how about an egg dish and something hearty while we're still waiting for spring to actually be felt? We love eggs and come Easter time, it seems especially appropriate to feature them. My fellas also love twice baked potatoes and I these potato skins are a great way to have it all. Cheesy potato shells holding a egg, topped with bacon is a hearty and satisfying dish for any meal. I adapted this recipe from Smitten Kitchen's latest book and I'm dubbing it breakfast (for dinner) potato skins because, frankly, I can't imagine "whipping" these up for breakfast given the time it takes to get them ready. I took a shortcut by microwaving the potatoes instead of baking them in the oven; that shaves about 40 minutes from the cook time but you'll still need up to an hour to (leisurely) get them on the table. So if you want my advice, make these for brunch, lunch, or dinner. There's nothing like a good potato and some eggs to fuel you through the long winter (I mean, spring...) days. Here's the lineup of ingredients for these breakfast (for dinner) potato skins. Instead of baking the potatoes in the oven for up to 1 hour (at 400 degrees), I microwave them to save time though it means forgoing a crisp shell. When I make twice-baked potatoes (inspired by a Food Network magazine recipe), it starts with microwaving the potatoes for about 16 minutes, until the potatoes are soft. Begin by scrubbing the potatoes clean, then setting them on a microwave safe plate. Prick the potatoes all over with a fork and microwave on high for about 15 minutes or so, turning them over midway. While this is happening, cook a couple of slices of bacon. You can brush the inside and outside of the carved potatoes with some melted butter, as per the recipe, but why not just use some of the bacon grease you have from cooking up bacon? That's what I did, then I sprinkled some salt and pepper over it, and set the potato halves - facedown - to bake for 5 minutes. Take them out of the oven, flip the potatoes around to face up and place about a tablespoon of shredded cheddar cheese into each. Return them to the oven to bake another 5 minutes. Now comes time for the eggs. Place an egg into each cavity (good idea to carefully crack the egg into a bowl first before sliding it into the potato). If any of your potato halves are sliding off to one side and you need to stabilize them, I find it helpful to scrounge up a small piece of foil and tuck it under the potato where you need it to help it stand up. Sprinkle the top of each with more cheese and return them to the oven to bake for about 10-15 minutes, until the egg whites are just set and the yolks are loose. Keep an eye and check on them after 10 minutes to avoid over cooking the eggs. If some are done before others, remove them as they are ready. To serve, top the potato skins with freshly ground pepper and sprinkle with chopped bacon and scallions. If you like, a dollop of sour cream on the side is nice as well. Prick potatoes all over with a fork and place on a microwave safe plate. Microwave on high for 15-18 minutes, or until potatoes are soft, stopping and flipping the potatoes midway. (Alternatively, bake the potatoes by pricking them and baking in a 400 degree oven for 50-60 minutes, until the skin is crisp and the potatoes are soft). Cook the bacon and coarsely chop; set aside. Halve the potatoes and scoop out the inside, leaving about a 1/4 inch border (reserve the scooped potatoes to eat another time; you can mash it with some milk for mashed potatoes). Brush the inside and outside of each with some bacon grease and sprinkle with salt and pepper. Set potatoes on a foil ined baking sheet - facedown - and bake for 5 minutes. Flip them around - face up - and sprinkle each with 1 tablespoon of cheese, then bake for another 5 minutes. Crack an egg into each half. Sprinkle the tops with the remaining cheese and bake for 10-15 minutes, or until the egg whites are just set and the yolks are loose. Begin checking after 10 minutes. Some potato skins might be done before others; remove them as they are ready to avoid over cooking the eggs. Plate potato skins. Grind black pepper over each and top with bacon and scallions on top. Serve immediately, with a dollop of sour cream, if desired. Now I'm off to ride out the rest of this snow day with a good book and some cookies. Remember the oatmeal chocolate chip cookie dough I mentioned I whipped up yesterday? I decided to try one of Sally's recipe; they are already baked and ready for snacking! Incidentally, there have been plenty of cookies around here. They get us through the winter and snow days, in particular. Recently, I revisited these double chocolate cookies I hadn't made in a while. They are just as good as I remembered...like a fudgy brownie with crisp edges! Very delicious! They are actually great for any meal. It does make a hearty meal! 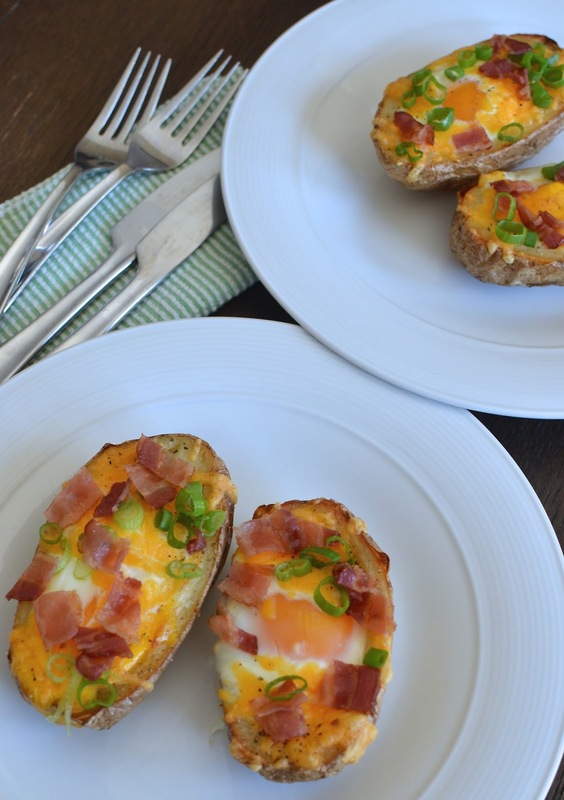 These potato skins look awesome and would be perfect for breakfast or dinner here! Hope you guys stay warm! It's been so cold here as well and we can't wait for spring weather! Hi Kelly - thank you. The storm turned out much calmer than we feared. I'm so relieved. Hang in there - spring (and summer!) will be here! That is so true...thank you! About the same here, Tricia. School was on a delay this morning. The sun is shining and I'm so relieved the storm was relatively calm and mild. Hope that was the end of that! This weather has been crazy! Come on, spring! These look amazing. So delicious! We had jacket potatoes filled with 4 different fillings for lunch today: red pesto, green pesto, mustard and olives, sooo good, they were gone in no time. This version looks great as well, eggs and bacon make eveything better. Okay...those jacket potatoes of your with all those different toppings? I'm wishing I could have had any of them. I can't resist a potato. What a yummy sounding meal good for any time of the day but I'm thinking Easter brunch would be very nice. You just can't help but think eggs for Easter. Since I adore eggs, it's a great excuse to eat some more of it. This winter really has been crazy. They said on the news the other day that on average we've been about 10 degrees colder than normal here - and it definitely feels it! ANYWAY. Spring is coming! haha And these potato skins are just too fun! I know...the last few years in general have been wacky. I really hope we saw the end of winter and spring/summer are coming to stay. I'm really looking forward to warmth and colorful food. I'll still crave hearty potato dishes like this but would be nice to have a ton of seasonal produce to go with it! These look so good! I would love to have these for my dinner, I think I have all those ingredients already! Hope you go for it! Egg, cheese, bacon and potatoes..what is not to LOVE about these. They look like shells of Heaven. The cookies are a bonus. I so wish I was living somewhere near you Monica.